Can a full grown woman truly love a midget? This is the question posed by the 1932 movie ‘Freaks’. The movie is about a young trapeze artist named Cleopatra who, upon learning of the sizable inheritance he posesses, seduces a sideshow midget named Hans to marry her. In reality, she’s infatuated with the strong man, Hercules. Hercules and Cleopatra are the normal folks in this carnival. Hans leaves his also-tiny current love interest to date someone outside of the ‘freaks’ he associates with. It tends to be classified as a horror movie, though I believe that’s a debatable fact. There’s a lot to discuss here regarding the morals and ethics of what’s going on in this movie, but not a lot of horror to be found. That said, it is considered a cult classic in the genre. Cult classics generally become cult because their audience is low and they are weird. Well, the latter speaks for itself and the former means this movie bombed where it wasn’t banned. In fact, it bombed so hard that director Tod Browning, who directed Bela Lugosi in Dracula, effectively had his career ended by this movie. The movie was banned for 30 years in the United Kingdom. It wasn’t until the 1960’s and 70’s when it was rediscovered and received some success at midnight showings . Nowadays, it still pops up on the more eclectic movie channels. So what was so horrible about it? Truly, it was just the fact that they used real sideshow performers as their actors. Characters like the Human Torso (a man with no limbs), the pinheads (people who suffer from a disease called microcephaley), and conjoined twins were simply too weird for audiences. Perhaps society felt bad staring, or maybe they rejected the idea of a movie that exploited them. The movie itself paints a really sweet picture of these ‘freaks’ as it were….casting aside the ending, of course. 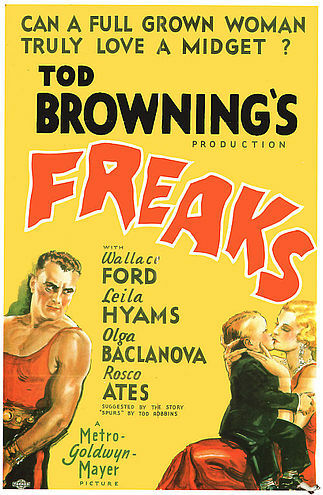 ‘Freaks’ has a lot of small side stories alongside Cleopatra’s conniving ways. We get to see the bearded lady have a baby, for example. The pinheads frolic in a field along with a midget and a man with no legs. Typing it out makes it sound a little weirder than the actual experience I received watching it, on second thought. The conjoined twins find love with two different men. As the second man announces his engagement to the other soon-to-be-husband he quips “You’ll have to come visit us sometime!”. The rest of the freaks join in, as he gleefully moves from freak to freak, offering them a drink from this glass. Of course, when he finally gets to Cleopatra, she goes crazy, cursing them, calling them terrible names and then throwing the drink at them. It doesn’t endear her anymore that she had poisoned poor Hans earlier in the night. The freaks find out about her treachery in the creepiest way possible, namely staring at her from under wagons. The climax comes in the middle of a thunderstorm and has some pretty creepy imagery which probably was what earned it the horror genre tag. I’ll save her comeuppance for your own viewing pleasure. Sideshows barely exist anymore. A lot of the acts from the old sideshows would probably be getting special care in homes or at institutions today. So, is it ok to watch this movie? Knowing that these people were being exploited? Or, in the case of this movie, is it ok because these people were not portrayed as anything but a well-knit family? Granted, a well-knit, vindictive family, but still. For some, such as Schlitze, one of the pinheads, the spotlight was what kept them happy. He (despite wearing dresses, Schlitze was a he) was institutionalized after his caretaker died. The hospital deemed the best care for him would be to stay in the sideshow as it was the only thing that kept him happy. When he died, he was interred in an unmarked grave in California. In recent years, a message board took up funds and had a small marker placed with her name, date of birth and death. I won’t say much about whether the movie is right or wrong, but if it weren’t for ‘Freaks’, no one would know Schlitze was buried there. This entry was posted on February 9, 2013 at 7:04 am and is filed under Scott's Horror Corner, Updates with tags Black and White horror, Freaks, genre, horror, horror movies, movie review, review, splatterpictures, Todd Browning. You can follow any responses to this entry through the RSS 2.0 feed. You can leave a response, or trackback from your own site. “Freaks” definitely wasn’t an exploitation. 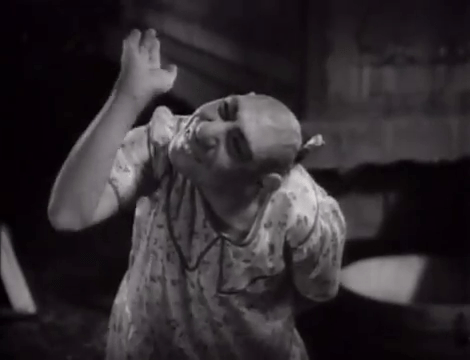 Tod Browning’s goal was to shock, but the actors all participated willingly. I’ve viewed & read multiple documentaries & biographies on sideshow performers. There were many cases of exploitation in the industry, but most appreciated the acceptance, sense of family, & livelihood the Sideshow afforded them. I think this is clearly the case for the performers in “Freaks”.